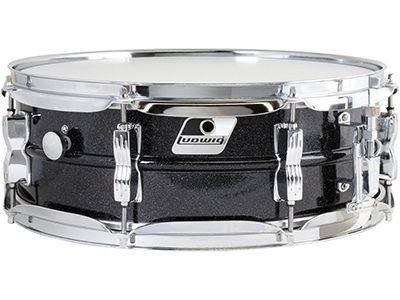 Ini­tial­ly mar­ket­ed as a stu­dent snare dur­ing its launch in 1963, the Lud­wig Acro­lite quick­ly gained renown through the music world for the instrument’s dry, aggres­sive ​“crack” and became a favorite among rock drum­mers. Made from a sin­gle alu­minum sheet in a mat­te fin­ish and housed in 2.3mm triple-flanged chrome hoops and bowtie lugs, the Acro­lite is a durable piece of equip­ment with a refined edge. The 5×14 mod­el ben­e­fits from a shal­low­er depth with utmost sen­si­tiv­i­ty and a focused, sharp attack. The 1990s mod­els, some­times referred to as ​“Black­ro­lite”, fea­tured a new black sparkle fin­ish that round­ed out the orig­i­nal lifes­pan of the Acro­lite series.